There’s a Punch for that! I am working on a video for Monday, September 12th, as a continuation on my series of videos for paper crafting beginners. What hand punches do I recommend for a beginner. First off…..Just because it is a paper punch does NOT mean you HAVE TO HAVE IT! Trust me. In that mess of punches, about 3/4 of them have not been used once since I purchased them. Not once. Never had its teeth (punch) sunk in paper. NEVER! Think about the many videos you have watched on YouTube. What about the blogs you have read? Someone has trotted out a punch. Told you how amazing it is. Shown you how to use it. Made the paper piece look amazing. Told you numerous times (in print or in video) how easy and smooth the punch was to work with. Your precious sweet mind is full of ideas for projects to make. Oh, you tell yourself, having that punch will make those projects pop and be even more amazing! You check on the availability of the punch at your favorite online stores, or even take a trip to your local craft/hobby store in search of this (cue a choir singing) punch that will make your creative life so much easier and even glorious! Do a search for a particular punch and several types show up. Down near the bottom of the page – or off to the right – are suggestions for something similar. OR WORSE YET a row of hand tools with the heading “What others bought along with this item”! You hop from one hand punch to the next. Which one? Which one? WHICH ONE SHOULD I CHOOSE? This one is more frilly. This one is so straight and I can use it with lots of stuff. If I get this one and this one I can layer them together. Oh, oh, oh! This one, that one, and THIS one! Yes! So…..you are at the check out. Online or at the actual store. Did you really intend to spend $45 to $60 dollars today? Small punches range in price from $4.99 to $6.99. Medium punches range in price from $7.99 to $10.99. Large punches range in price from $15.99 to $24.99. That mess of punches on my work table equates to about $400. Seriously! Punches can be expensive. For a beginner paper crafter the price can be way to far out of their budget. 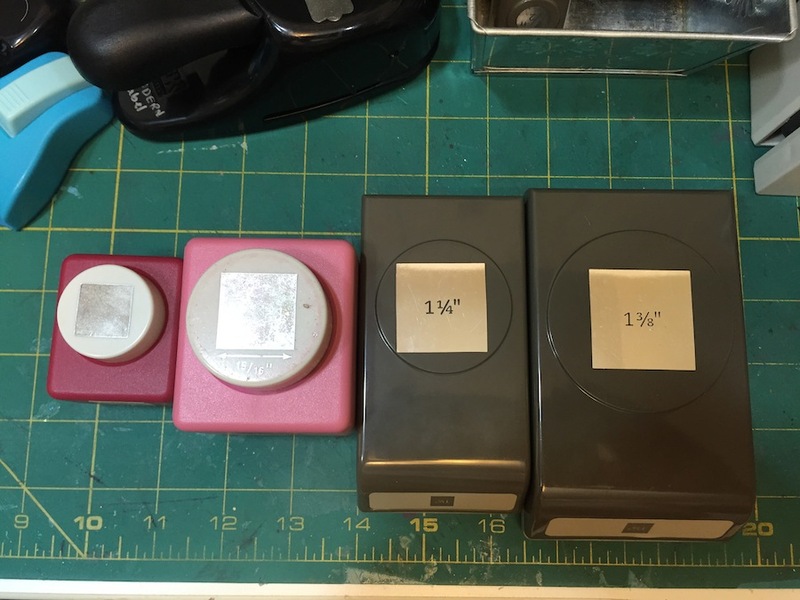 So how do you go about acquiring a set of punches? One at a time. 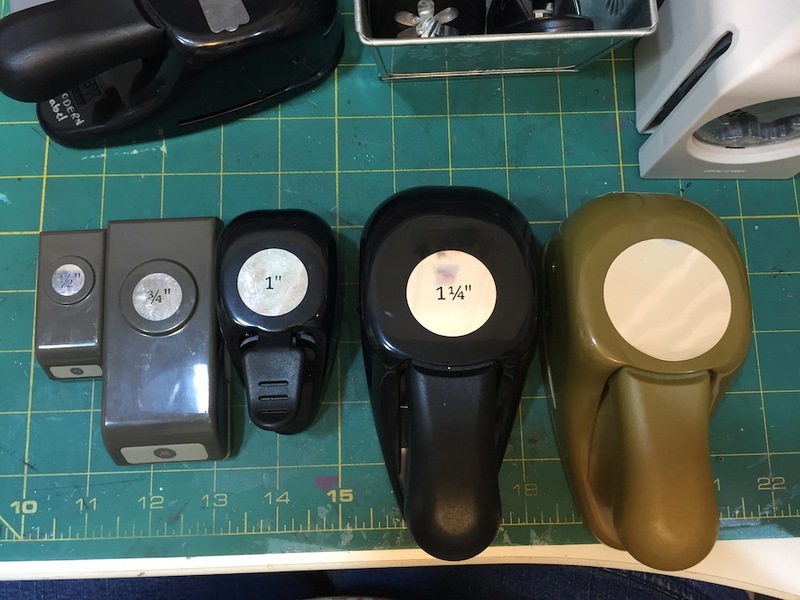 If you keep watch on the sales of your favorite stores – even their clearance sections – you can find good deals on punches. Those days you may be able to get two punches for under $20. Start off with the BASIC SHAPES. These can be used in so many ways. Their versatility will always make for interesting scrapbook layouts and/or greeting cards. I hope to have a video up on Monday to show these punches. I’m having some difficulty right now. How long does it take you to vacuum your home, do a quick dusting, clean the toilets, sweep and mop the kitchen and bathroom floors? Used to take me about 2 hours. Do that in 2 hours now and the rest of the day, along with tomorrow is spent napping most of the day away. Fighting the pain that comes with it. Grocery shopping by myself for 3 hours then putting things away is getting harder and harder to do. Recovery time is about the same, nearly 2 days. So I’m learning that to get done what I want and need done can be as long as 4 days to do. If I want to remain awake and able to function or be comatose. Mom2Create, a subscriber to my YouTube channel, asked in a comment what tools I would recommend to beginners? Thank you, Janette (Mom2Create) for this great question. When I started making scrapbook layouts, way back in 2003, I watched every video I could find on the subject. I read hundreds of internet articles on the subject. Blog posts, HGTV’s website that offered paper crafting information, anything I could find. I bought books and magazines dedicated to scrapbook layouts. The magazines and videos were largely based around Sizzix die cutting machines and the various dies available. I had a problem. 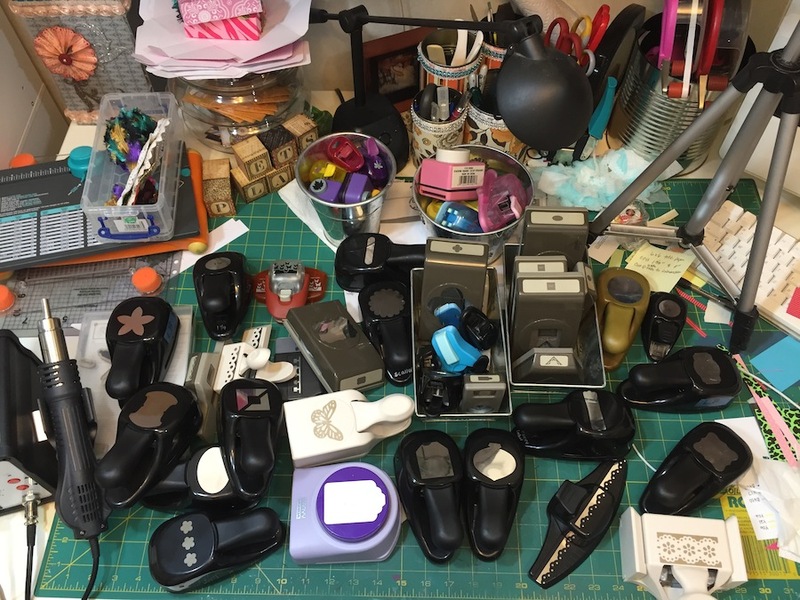 Everything I read or video I watched was geared to the crafters that had ready supplies and tools on hand. I, basically, had nothing. I had a grid ruler that I bought in 1993 or 1994 which I used in my sewing. I tried my hand at quilting…..and found that to be something I did NOT enjoy one little bit. I had fabric scissors. That was the extent of my paper crafting hand tools. In a state of frustration one day in 2004 I did the worst thing I could have done. I went to my local craft/hobby store and began loading my cart with all kinds of stuff. For one minute imagine if you will, or even remember, going into a grocery store really hungry. You start off with good intentions to purchase the necessary food items for meals and replenish any pantry or condiment items you are out of. PLUS you go into the grocery store without a LIST! Everything looks good to eat. Stomach grumbling. Brain telling you it is time to eat. The food items you originally went in to purchase for dinner are no longer in your memory. In fact, you can’t remember what you went to the grocery store for in the first place. Maybe you’ll remember what it was as you wander the aisles. When I got home from my shopping at the craft/hobby store I had paper. Slabs, pads, packs, and bundles of paper. I had rubber stamps that looked interesting. What I didn’t have was a paper trimmer, nor did I have an ink pad to use with the rubber stamps. I didn’t even get a pair of paper scissors. In essence I went down the cookie aisle and loaded up with every kind of cookie I saw that looked good. 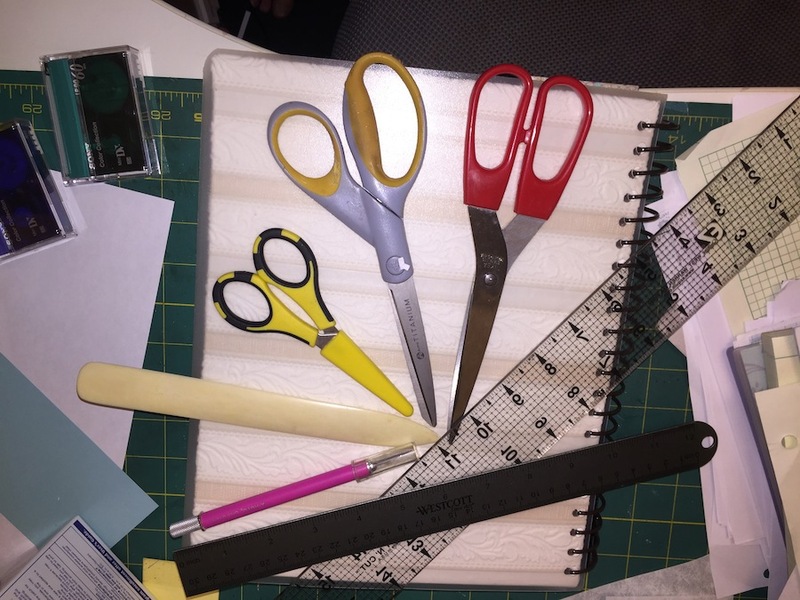 In this series of videos and blog posts I am going to start with the rudimentary tools a person needs to begin paper crafting. The items I have chosen to start this series are essentials that will be your foundation. With these few tools….scissors, rulers, bone folders, and craft knife……you can create anything with these simple tools. I have a YouTube video demonstrating these tools. What to look for, which tool to choose for your needs. I tell you why you need two pairs of scissors. One for paper and one for fabric (ribbons, lace) and what to look for when buying a pair of scissors. I have a pair of kitchen shears that I use frequently. These are really OLD and at one time they were top of the line in the scissor world. Wiss brand. Over the years they have been used by others that have put them to work in situations and places that I will never visit. 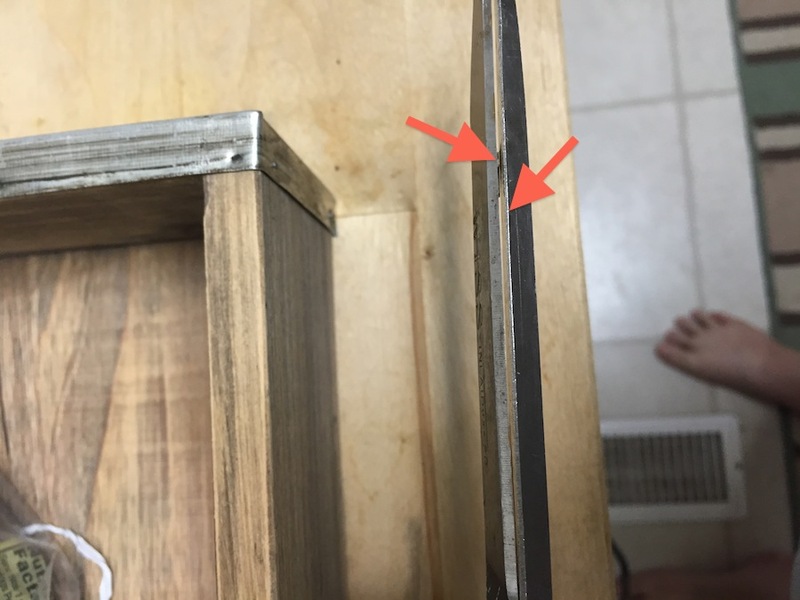 The blades are separated and cause problems from time to time. When purchasing scissors look closely at them closed. There should NOT be a gap between the closed blades. Here is the first video in the series. Maybe I will remind a long time crafter of what they did in the early days of their creating. Or maybe give you a tip that makes placing letter stickers in position easily.